When temperatures plummet, families gather and hot water use increases, Elek Plumbing SuperSTARs experience a flood of calls about winter plumbing problems. Steer clear of these common plumbing issues by carefully maintaining home plumbing systems, being vigilant about water heater inspections and calling a licensed professional at the first sign of plumbing trouble. Waiting too long to get help could result in a ruptured pipe, flooded home or total water heater failure. Problem: It’s no surprise that our most common winter repair call is frozen pipes in below-freezing Allentown and Bethlehem temperatures. 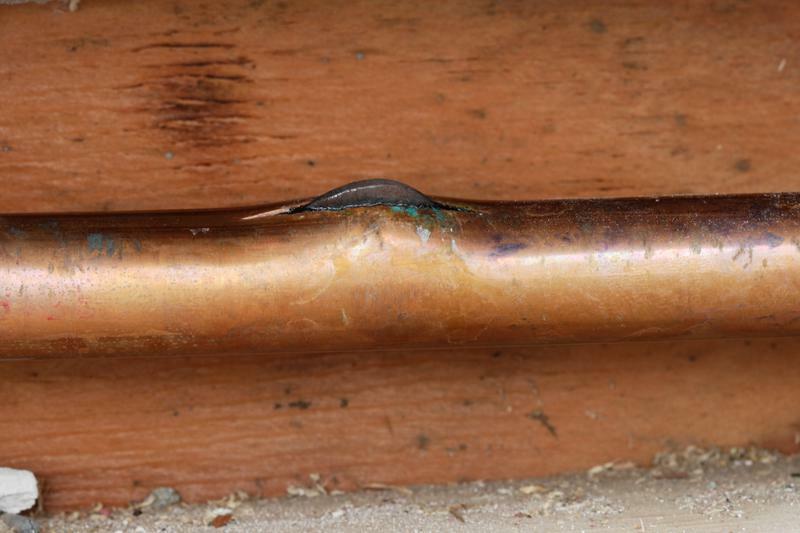 Symptoms of pipe freezing include a lack of running water, restricted water flow or frost on the affected pipe. Prevention Tip: Insulating attics and basements can help to minimize pipe freezing. During especially cold weather, let your tap drip overnight and open cabinet doors to allow for air circulation around pipes. You may also wish to insulate vulnerable plumbing and increase heating temperatures in areas of your home where pipes are likely to freeze. In the event a frozen pipe bursts, shut off the main water valve and contact a plumber immediately. Problem: Indoor cooking increases during winter and the resulting grease and food particles can gum-up inside cold pipes. Prevention Tip: To reduce the chance of oil and grease sticking to your pipes, collecting food particles and creating a blockage, run hot or boiling water down the kitchen drain every day. You may also wish to keep bacterial drain cleaner on hand. When used routinely (1-2 times per month), enzyme-based cleaners can reduce the incidence of clogs. These cleaners are not, however, designed for use in a drain emergency. Report frozen pipes by calling 610.432.7001. Problem: Your tank or tankless hot water heater works harder during winter to warm up your water. Signs of a malfunctioning water heater include rapidly increasing utility bills, slow-to-heat water, NO hot water, or a hot water supply that diminishes quickly. To begin with, try turning up your water heater thermostat and add an insulative jacket to your appliance. Always stay current on water heater flushing and maintenance, and report leaks or rusty water promptly. If the DIY tips above don’t solve your plumbing problem, you need a plumber in the Lehigh Valley. Elek’s award-winning SuperSTARs deliver fast, dependable attention for winter repairs and plumbing emergencies. One of the best ways to keep your plumbing in tiptop shape, season after season, is to purchase a comprehensive Elek Plumbing Maintenance Agreement. This valuable investment pays for itself quickly, extends the life of plumbing systems and appliances, and assures priority service when inevitable repairs arise. And, as we’ve said in the past, an ounce of prevention is worth a pound of cure. Winter plumbing emergency? Clogged drain or water heater failure? Call 610.432.7001 to request 24/7 service you can count on. Specializing in leak detection, drain jetting, water heater troubleshooting, water treatment and general pipe repair, Elek Plumbing has been serving the Lehigh Valley for over a century. Trust our team for exceptional service and affordable peace of mind this winter—and into the spring.